Many individuals are concerned that the trade wars could spiral out of control. While they could spiral out of control, the fact is that for now, the trend has not changed. In theory, anything could spiral out of control, but the problem with theoretical constructs is that when you go down that road, you can spend all your time on the what if scenario and miss the action that’s taking place in front of your eyes. Moreover, that’s why the field of economics is referred to as the dismal science. Having said, we are paying very close attention to the current situation, and if we detect anything out of the norm, we will take the appropriate defensive measures as was the case in Jan of this year. We were asked us to comment on the Putin Trump summit. Our view is that personal opinions are on par with gossip, music to the ears and toxic for the mind. We don’t let our own beliefs get in the way of the trend. Whether we agree or disagree with the way Trump handled himself at the summit is irrelevant; the trend is all that matters. 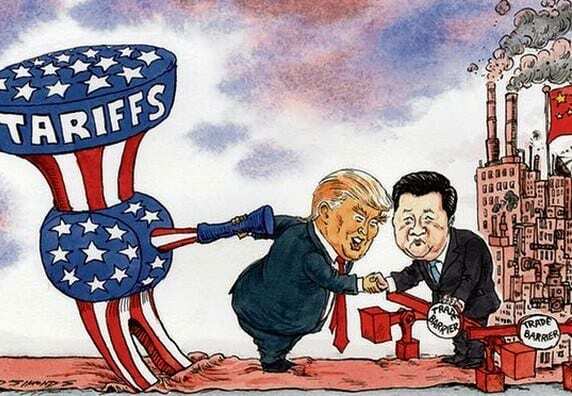 Trump is attempting to build an alliance against China though that would not appear to be the case on the surface given the adverse comments he has made about the EU and NATO. We never spoke against many of China’s misdeeds in the past, as the trend was on China’s side so it would have been a waste of time to pontificate on this subject. On the same token, we never spoke of the immigration problem Europe was facing until the trend had changed. Many feel that Trump was too soft on Putin, while some feel he did the right thing; for example, both Ron and Rand Paul support Trump’s effort. In general, we respect Ron Paul’s views when it comes to geopolitics, hard money but not so much when it comes to dealing with the stock market. If you focus on the wrong perspective the analysis will always be wrong. In this case, the primary development that one should focus on is whether Putin and Trump came to an understanding concerning China and it appears (appears is the keyword) that they might have. China’s attempt to woe Europe will most likely fail, for despite the differences Europe is facing with the US, they know that dealing with the belligerent US is far better than dealing with China, a nation that does not seem to follow the same set of rules it expects from its western counterparts. This is not an ordinary trade war and this bull market as we have alluded for years is not a typical bull market. Free market forces were eliminated years ago, and therefore it’s even more pertinent now to follow the trend and not focus on the gossip factors. In short, the trend indicator will let us know if the landscape is changing and if it does, we will make the necessary adjustments. It is dangerous to focus on what if scenarios; once you go down that road it’s virtually impossible to focus on what’s taking place right in front of you. We have covered the Alt-Right advance in Europe at length and the way the tide is turning against immigrants in great details, going forward, we will go silent on both unless the trend changes significantly. From time to time we will post random stories illustrating the trend in motion, but we will not focus on it as we have done for the past few weeks. We will instead start looking at other trends that are beginning to emerge, AI, Robots, Life extension, the new immorality trend, etc. There is something behind this whole polarisation trend that 90% of the populace is missing. If you recall we stated that a polarised person is a person that is very easy to manipulate and steal from. We call this the “big con”, the populace assumes things will get better because things are finally going their way. This topic is beyond the scope of this publication. There is a hidden order to everything, and it’s usually easy to spot if you are not carrying excess luggage. Here’s a clue for those who like challenges. The national debt in 1929 was 17 billion dollars, and it amounted to only 16% of GDP, contrast that today where its 107% of GDP and we add $ one trillion to it every year and remember what we just mentioned; polarised individuals are the easiest to fleece.